Growth hacking is modern marketing term you hear used throughout a number of different industries. 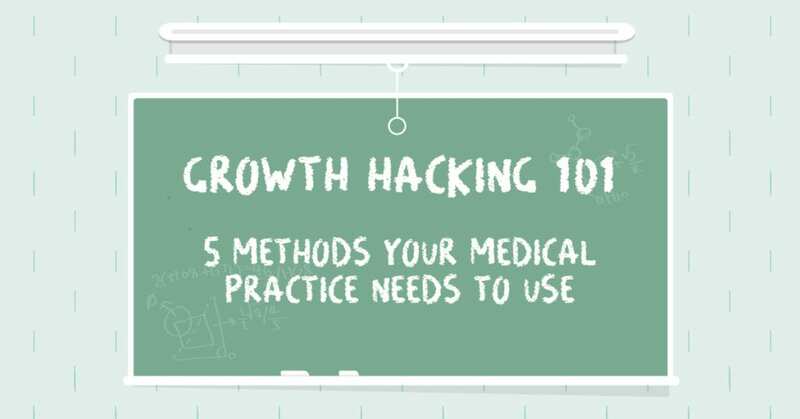 But did you know that your medical practice could also benefit from a few simple growth hacks? Sometimes marketing feels like a chore if you’re not seeing the kind of progress you had envisioned. Practices are always looking for ways to accelerate their growth. Because who likes the waiting game? While growth often requires patience, the good news is that your practice doesn’t need to wait to start exposing more and more potential patients to your brand. In this post we’re going to touch on five essential growth hacking methods that can help you get the word out, grow your practice’s online following, and build up your medical practice at rapid speeds. Think of your brand as the foundation for everything your practice does. In 2018, branding is simply that important. Your potential patients live on image-based applications like Instagram and Snapchat, where they are constantly exposed to the branding of different companies. You need to put your practice in that same position. Many practices neglect branding because they don’t think it’s important in their line of work. They couldn’t be more wrong! Branding is one of the only opportunities you have to separate yourself from your competition. Skimping on branding or bypassing it all together is going to keep you treading water for as long as you’re in business! Identify what makes you different from every other practice, doctor, or surgeon, and build your brand around it. You need to tell your story before you sell your story. Set your opinions and biases aside and get over your fear of social media. In a short amount of time, it has established itself as a digital marketing staple. One of the best business decisions you’ll ever make is to incorporate social media into your marketing strategy and make of room within your budget for it. Every dollar you spend on social media (when used wisely) will pay dividends in the future and further your brand recognition. There’s no excuse for ignoring solid search engine optimization (SEO) practices. We know so much about Google’s secret algorithm that we have access to a laundry list of items that the famous search engine likes and dislikes. What do you have to lose by optimizing your site and its content? Maybe a little time? A little money? This all pales in comparison to the potential reward for using smart SEO practices. Leverage SEO principles whenever and wherever you can, and stay disciplined! Growth Hacking Tip #4: Start Your Blog Now, Market It and BE CONSISTENT! Today, it seems as though every business has its own blog. It’s not because every one of these businesses has new groundbreaking ideas or information that no one’s ever heard before. It’s because they see the value in content development and content marketing alike. These two items have become vital cogs in a business’s marketing machine. Content can be used to generate organic traffic, develop leads, build customer trust, and establish authority. If writing isn’t a strong suit or if you simply don’t have the time to produce great content consistently, hire a talented ghostwriter who knows about your niche! But be consistent. A site with a blog that hasn’t been updated in months will be view less favorably by Google and other search engines than one that doesn’t have a blog at all! Then make sure you have a marketing team and plan in place to get your content to as many people as possible. And that leads us to . . .
Perhaps the best growth hacking tip we can give your medical practice is to work with filmMED. We help practices brand and market their businesses so that they can maximize their company growth at whatever stage they find themselves in. We have the experience and knowledge to help you make smart marketing decisions that will grow your practice and help you reach your goals. Trying to do it all yourself or in house means you will be using your valuable time and money on something other than making sure you give your patients the best possible experience. Let us help you reach your goals and more potential patients. Get in touch with us today to find out how you can grow your medical practice!